*The news story published on The New Indian Express, where CPPR’s Chairman, Dr. D. Dhanuraj points out the concerns regarding the KMTA bill. KOCHI: Though it has been a year since the Kerala Metropolitan Transport Authority (KMTA) Bill was passed in the Legislative Assembly, the entity continues to remain a non-starter. And even as the delay may affect the implementation of the Kochi metro’s expansion, the structural deficiencies in the proposed plan is the most worrying, according to experts. Lack of clarity in the role of the authority is the biggest roadblock, experts point out. “Though the focus is on the city’s transport management, the state government has now proposed to constitute the authority at a state-level, instead of a city-level. 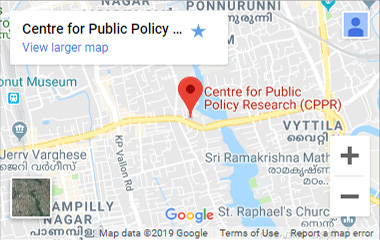 There is no clarity about this in the proposed bill,” said D Dhanuraj, chairman Centre for Public Policy Research (CPPR). According to experts, it is contradictory that the heads of all major transport bodies in the city will be helming the KMTA when instead their sectors should be regulating by the authority. “KMTA is a regulatory body; not an operational one. In that sense, the executive board of the authority should be free from everyone who is part of the system. As per the current plan, managing directors of Kochi Metro Rail Limited (KMRL), Kerala State Road Transport Corporation (KSRTC), among others will constitute the core team which will raise the conflict of interest,” said Dhanuraj. Despite being a city-specific body which is aimed at regulating intracity transportation, the Kochi Corporation has the least representation in the board. The municipal body’s secretary is the ‘ex-officio’ member. “If we consider successful unified metropolitan transport bodies like London and Singapore, it is the city mayor who heads the body. But here, the mayor has no role in the decisions. Though many recommended the corporation secretary to head the board, the issue of a junior IAS officer regulating the senior officials of bodies like KMRL and KSRTC will definitely make problems,” said a transport expert. A former councillor of Kochi Corporation rendered a similar view. “We have raised the issue in the last KMTA sitting at Kochi and the absence of elected representatives’ affects its major functions like management and facilitation. The unavailability of full autonomy is another problem as it reduces the authority to a mere wing in the bureaucratic structure,” he said. Despite having the power to execute a comprehensive mobility plan for the region, the need for approval of state government for decisions like re-alignment of road transport services didn’t get a space in the bill. “There are many structural deficiencies in the bill. There is no mention of integrating the Motor Vehicle Department which gives permits for the new bus services. It is the body which plays a vital role in the realignment of services. So, KMTA should not be an advisory body to the government. Instead, it should be a powerful regulatory body whose decisions are binding to everyone,” said Dhanuraj. Echoing a similar sentiment, a top-level KSRTC official said “The lack of a clear idea over the structure of the body will prevent the body from achieving its objectives. If it remains to be a mere recommendatory body to the state government, there won’t be much difference in the ground. As many Kochi roads have already been nationalised, regulating and re-routing the KSRTC services will be a major impasse before the authority,” he said.